Water is the single most important thing that your dog needs to consume every day. While you can easily switch out foods recipes and experiment with the ingredients that go into your pup's daily meals, there is no wiggle room when it comes to water. Hydration is crucial for healthy living. 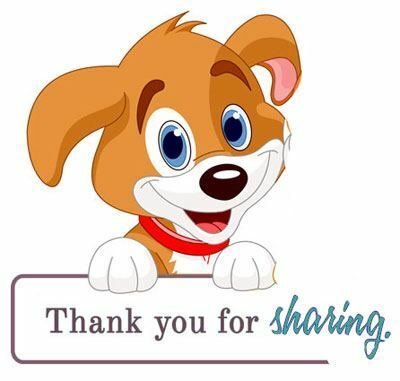 This isn't specific to canines, but to all living creatures. Your precious pup needs to stay hydrated to keep their organs functioning and their cells healthy. For most canines, drinking water is a no-brainer. It's something that comes instinctively to them. Most will have no problem gulping down water after a long day of play. However, there are many instances in which your dog may not drink as much as they should. It can be alarming to see your pup's water bowl relatively untouched at the end of the day. So what are you supposed to do? If you notice that your dog isn't drinking much water, there's no time to waste. Dogs release heat differently than we humans do. Your pup can experience symptoms of overheating and dehydration within a matter of hours. Luckily, there are many things you can do to get your pup to drink more water and stay healthy. How Much Water Should My Dog Be Drinking? Truth is, your dog can't get too much water. The more water they drink, the healthier they will be. There are many studies out there to determine the exact amount of water a pup needs. Numerous factors come into play. These include size, breed, and activity level. The type of food you provide your pup may also affect their daily water requirements. Canned food has significantly more water than its dry counterparts. While there is an exact science to canine water intake, most veterinarians and canine experts agree that dogs need about one ounce of water per pound of body weight each day. If you have a tiny eight-pound pooch, they'll only need eight ounces of water each day. This is equivalent to about one fluid cup. However, if you have a large dog that weighs around 65 pounds, they'll need as much as two full liters of water every single day. Should I Portion Water Every Day? When you're planning your pups food, proper portioning is crucial for maintaining a healthy weight. However, there's no need to portion out water. You should always provide a constant supply of fresh water for your dog. Ideally, your dog will drink water multiple times throughout the day. To ensure that they can rehydrate, you need to make sure that your dog's water bowl is always filled. While your dog's eating and drinking schedule may remain constant for most of there life, certain issues can affect their habits. Dogs are complex creatures with ever-changing needs. Unfortunately, they're not able to come right out and tell you what's wrong. It's your job as an owner to notice changes and take actions. Here are some common reasons why your pup may not want to drink as much water as they should. A sudden change in drinking habits should be taken seriously. Medical conditions can quickly take their toll on your pup's body. Some ailments, such as a urinary tract infection, diabetes, or kidney disease, are known to affect a dog's taste for water. They can have a drastic effect on your dog's appetite and cause them to avoid water completely. Some temporary issues can also cause make a dog not want to drink water. Stomach discomfort may make your pup avoid eating or drinking for a day or so. Either way, it's important to take your dog to a vet as soon as possible. You should seek veterinary assistance if your dog doesn't drink water for a full day. The sooner you get a proper diagnosis, the better. Your veterinarian will perform a variety of tests to determine the underlying cause. They may be able to diagnose the problem and find a suitable treatment option. If your dog is dehydrated, they may provide you with thirst-inducing medication or apply intravenous techniques to get your dog hydrated. While no owner wants to face the reality that their dog is getting older, it's an important thing to consider. As dogs age, they can experience body aches without you ever realizing it. Some dogs suffer from osteoarthritis or hip dysplasia, making it difficult to get up and walk around. If that's the case, getting up to get a drink of water may not seem worth it in the mind of your dog. You can solve this issue by placing their dish closer to them. Oftentimes, handicapped dogs will crawl to their bowl and take a drink lying down to alleviate the pain. It's also a good idea to visit a veterinarian to see what you can do to improve your pup's quality of life. Dogs can be just as picky as humans when it comes to the quality of their drinking water. While most canines will have no problem drinking any water you put in front of them, some will only drink filtered, distilled, or even chilled water. You may want to do some experimentation to find out what your dog prefers. In many cases, purified water is a simple solution. Instead of giving them the water that comes out of the tap, provide them with bottled water. Alternatively, you can run the tap water through a charcoal filter to get rid of any impurities that affect smell and taste. All dogs will have fluctuations in their thirst levels. If your dog spent all day running around outside in the hot sun, they're going to want to drink a lot of water. Alternatively, a pooch that spends his or her day lounging around in an air-conditioned home isn't going to feel the need to drink a ton of water. A slight decrease in water intake isn't something you need to worry about. However, when they're drinking significantly less water than they should be, you may need to try to increase your dog's thirst levels. If you have ruled out medical issues, you can employ various techniques to get your dog to drink. These techniques are very simple. However, they can make a huge difference in your pup's overall health. There's nothing worse than drinking lukewarm water that's filled with dirt and bacteria. You should change out the water in your pup's bowl regularly throughout the day. Stagnant water can become a breeding ground for bacteria and bugs. Not only is this unappetizing for your dog, but it can also lead to some serious health issues. It's a good idea to provide your pooch with filtered water that's cool. If you want, you can even add a couple of ice cubes to the water to keep it cold longer. Just make sure that your dog is healthy enough to chew on the cubes. Ice comes with its own risks, such as choking and dental damage. It's not uncommon for owners to neglect their dog's bowls. Unfortunately, this can lead to some problems. 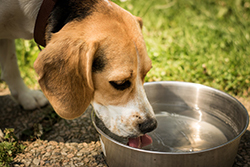 As mentioned earlier, your dog's water bowl can be affected by bacteria. Mold can start to develop on the sides. If you use a plastic bowl, the chemicals within the plastic can also break down, affecting the water quality. It's important to clean your dog's bowl on a regular basis. Use antibacterial soap to ensure that it's as clean as possible. It's also good a good idea to invest in a stainless steel bowl. They stay clean for much longer and won't degrade in quality if you take care of it. A dispenser is a great tool that can benefit your pup. Simple dispensers come with a large reservoir that holds many gallons of water. 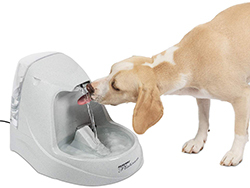 They will fill up the bowl as your dog drinks, ensuring that your pup always has access to water. Fountains can make dogs thirstier. A small pump hidden in the fountain housing creates a small waterfall. The sound of moving water is a natural attractant. You'll notice that your dog takes a drink more often. Fountains and dispensers also have additional benefits. In addition to having a large reservoir, many have built-in water filters. They keep the water clean and fresh as it circulates the system. If you have a larger house, having multiple bowls can be very beneficial. Sometimes, dogs who roam a large house are simply too lazy to take the walk to their bowl. You can place a bowl near the entrance of the rooms your dog frequents. At the very least, you should have a bowl on every level of the home. Your dog will appreciate the easy access to water. Another thing that you can do to increase your dog's water intake is to soak their dry kibble. Depending on the brand, dry kibble is comprised of as little as six percent water. This is quite low compared to the 30 or 40 percent that canned food has. Before dinner time, let the kibble soak in some water for a few minutes. The kibble will get very soft, which is great if your pup has dental issues. Not only that, but the water releases the smell of the food. While it may not be very pleasant to you, that aroma will make your dog salivate. Alternatively, you can soak the kibble in some low-sodium chicken broth. The broth provides plenty of hydration while adding a boost of delicious flavor. You can also mix dry kibble with canned food. The canned food's gravy and natural water content will soak into the kibble. Sometimes, the simplest solution is to just get your dog some extra exercise. Physical activity heats up your dog's body and tires them out. Dogs don't have as much sweat glands as we do. They regulate body temperature by panting, which leads to increased thirst levels. Take your pup out for a walk and fill up their bowl when you get home. If you're going for a long walk, take a bottle of water with you. Some dogs won't drink from unfamiliar sources. Furthermore, you can't always tell how clean water from a fountain or hose is. Portable water dispensers with an attached water bottle are a great thing to have on hand. You may be able to get your dog to drink more water by allowing them to empty their bladders more often. If your canine companion isn't able to go outside for many hours at a time, they'll have to hold their full bladders. As a result, they avoid drinking water to prevent accidents. Let your pup go outside to do their business more frequently. You can also train your pup to use a potty pad when you're not home. Believe it or not, you can train your dog to drink water on command. While most owners focus on house training, tricks, and behavioral modification when they first bring a new puppy home, it's a good idea to slip drinking commands in the training routine. Every time your dog gets a sip from their bowl, praise them in a comforting voice. You can create a voice command as well. Simply say the word, "drink," positively when they're gulping down water. Eventually, they'll associate drinking with attention and praise. You can then use the command to make sure that your pup is drinking all the water they need to stay healthy. It can be very worrisome to see that your pup isn't drinking water. The first thing you need to do is rule out any serious medical conditions. From there, you can use these simple techniques to increase your pup's water intake. By staying hydrated, your dog will have all the fuel they need to keep their bodies in tip-top shape.